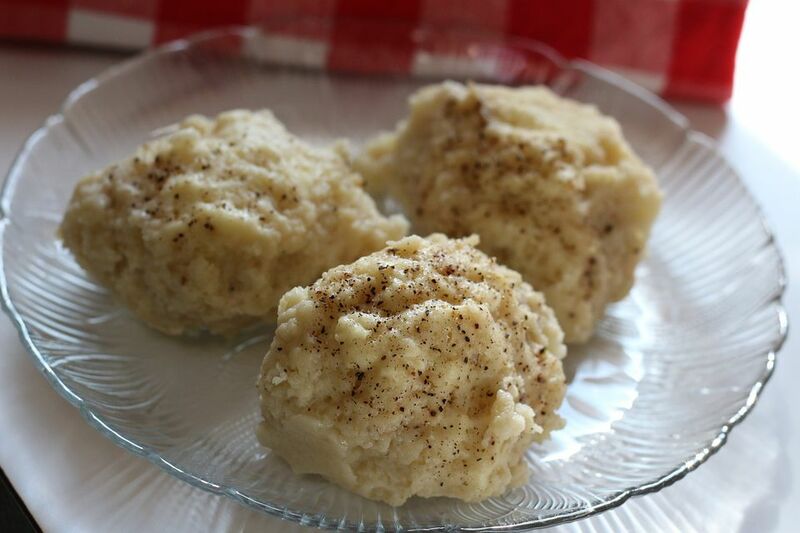 Croatian plum dumplings - knedle s sljivama - are made with a mashed potato dough and can be eaten as a dessert when sprinkled with sugar, as a meatless main course or as a starch accompanying a meat dish. Plum dumplings are common throughout Eastern Europe among Poles, Hungarians, Romanians and wherever plums are plentiful. The small damson plum is preferable, but Italian prune plums will work fine. In a large bowl, combine potatoes, eggs, and salt. When well combined, add flour and mix until soft dough forms. Place a sugar cube in the center of each pitted plum. Place a large pot of salted water on and bring to a boil. Using lightly floured hands, take a portion of dough and pat it flat in your hand. Place a plum in the center and bring sides of dough up over plum, enclosing it completely. Moisten edges if necessary to seal. Carefully drop into boiling water. Repeat until all plums are in the water. Cook 20 minutes. Meanwhile, melt butter in small skillet, add bread crumbs and brown. Using a slotted spoon, remove dumplings to a colander. Transfer to a serving platter and pour buttered crumbs over dumplings. Dust with granulated or confectioners' sugar and cinnamon, if desired.